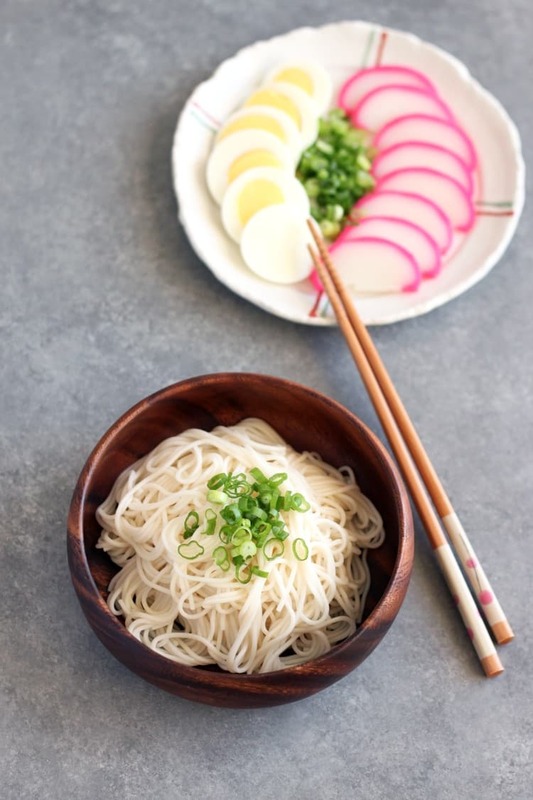 Somen are thin Japanese noodles, traditionally served cold with a dipping sauce. 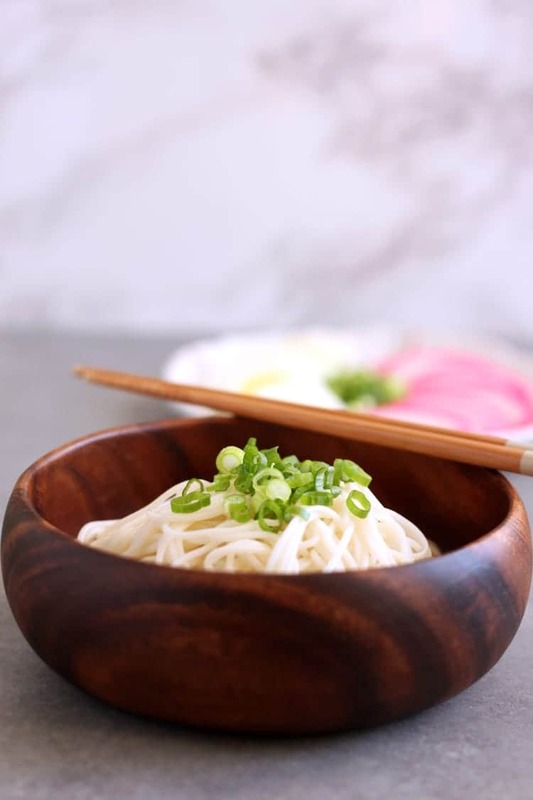 Cold Somen noodles makes for a quick and easy meal during hot summer days, when all you want to do is sitting in front of a fan rather than standing in front of a stove. Before you delve into this post and this recipe, I have a confession to make. The way this recipe is written is how we (my husband and I) eat Somen at home, and in no way do I claim this to be an authentic Japanese recipe. There is still some cooking required for this recipe, but I will try to limit your standing-in-front-of-a-stove-time to a minimum of boiling eggs and preparing the dry noodles. 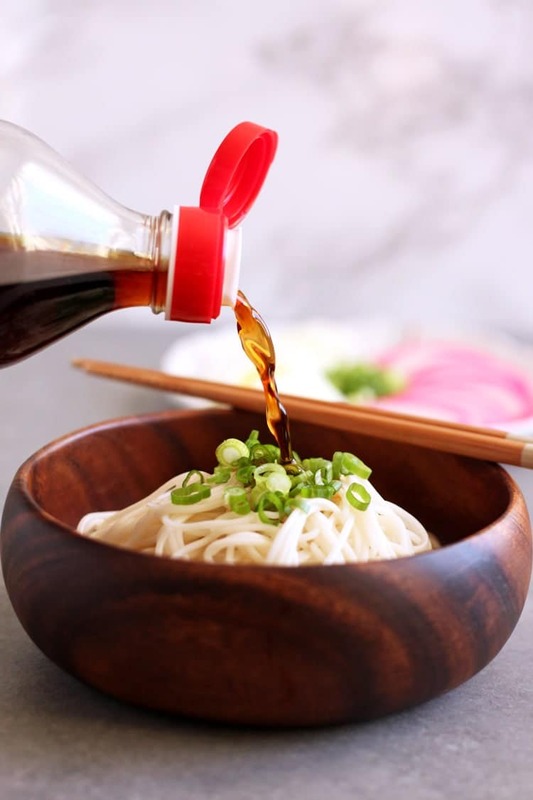 Somen noodle soup base – this is the dipping sauce for your noodle. You can buy a straight sauce, like the one in the picture, which you can use directly for dipping or to dress your noodles. There is also a more concentrated version you can buy, which will require dilution when used. If any of the sauce is too salty for your taste, dilute with water. Note that this is not meant to be a broth for your noodle, so don’t dump the entire bottle to fill your noodle bowl. Dry Somen noodles – just like pasta, you can buy dry Somen noodles. They are very thin, delicate, white, round noodles. One package usually comes with multiple bundles, with cooking instructions on the back side. Some brands do have English instructions. Kamaboko – this is Japanese fish cake. It comes in many different forms and shapes. But the one pictured is the one I usually buy for this recipe and to add to other recipes such as ramen, hot pot, fried Asian noodles, etc. You should be able to find all three of these ingredients in a Chinese grocery store such as 99 Ranch, or a Korean supermarket such as H-mart, and any Japanese markets such as Marukai, Mitsuwa, Nijia. These are the stores I frequent in SoCal, there might be other Asian grocery stores near where you live. Roasted seaweed – I buy roasted seaweed snack pack to serve as a side dish. These come in small rectangular packages. They are usually roasted in sesame oil or grapeseed oil, and salted. These are not the large sheets for making sushi rolls. I have seen roasted seaweed snack pack at American grocery stores such as Sprout’s and possibly Trader Joe’s. But I prefer the ones from Asian market. Cucumber – sliced cucumber is a clever way to add some greens to your meal. It is also a refreshing side dish during summer. Sautéed vegetable – to add even more greens to your meal, you could sautée Bok Choy or baby Bok Choy or your choice of greens with garlic. Set aside to cool, and serve cold. Skip this if you want to absolutely minimize cooking time. Fried egg – instead of hard boiled eggs, you could scramble and fry into a sheet, then cut into thin slices. Tofu – I like to use medium firm tofu because it is easy to slice. Cut into thin slices, top with green onion and soy sauce. Serve cold. Any other vegetable or meat left over in your fridge. This meal is not meant to be fancy, and authenticity is not invited. 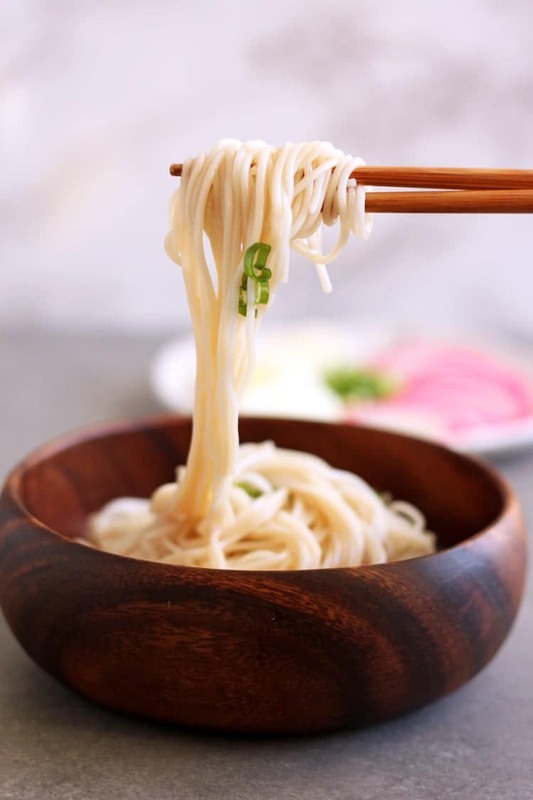 This post is a suggestion to the multiple options you have for creating a quick meal based around cold Somen noodles. With the variety of topping and side options, you may recreate this meal without ever feeling like eating the same thing. Put eggs in a medium sauce pan and add water to cover. Bring water to a boil over high heat, reduce to medium heat and let boil for 9-10 minutes. Then immediately remove eggs and dump into an ice bath to cool. Refer to instructions on the package to prepare noodles if possible. Otherwise, bring 3 quarts of water to a boil in a tall pasta pot, add noodles and cook for 2 – 3 minutes until noodles are done, stirring with chopsticks. Immediately drain noodles and rinse under cold water in a colander. 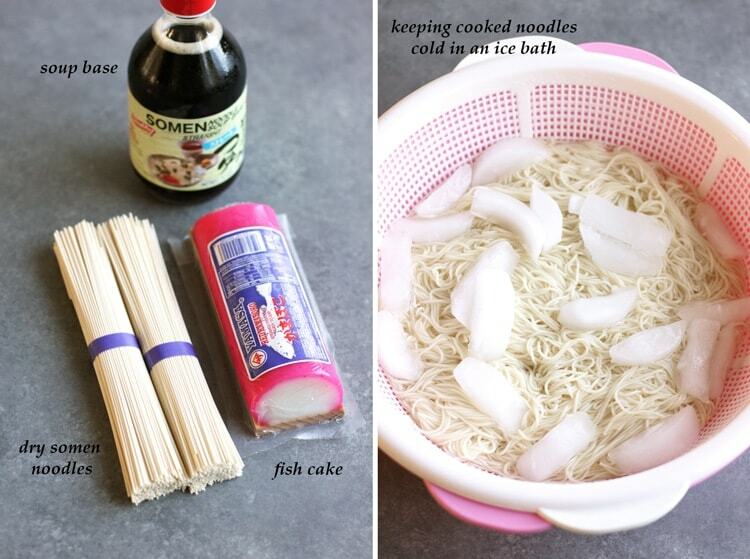 Let noodles sit in an ice bath. Open the Kamaboko package, peel it off the wooden base with a knife and cut into thin slices. Peel eggs and cut into thin slices with an egg slicer or a knife. Wash and slice the green onion thinly. Add some noodles to a bowl, top with Kamaboko, egg and green onion, dress with soup base and enjoy cold. Trang is a monthly contributor on All She Cooks. She works as a process engineer during the day, and writes over at her personal blog, Wild Wild Whisk, during her spare time. She is passionate about baking, reading, yoga and her fur babies.